One of my favorite photographs, a snap I took one night in La Jolla on a muggy July night on a residential street behind a popular Chinese restaurant . 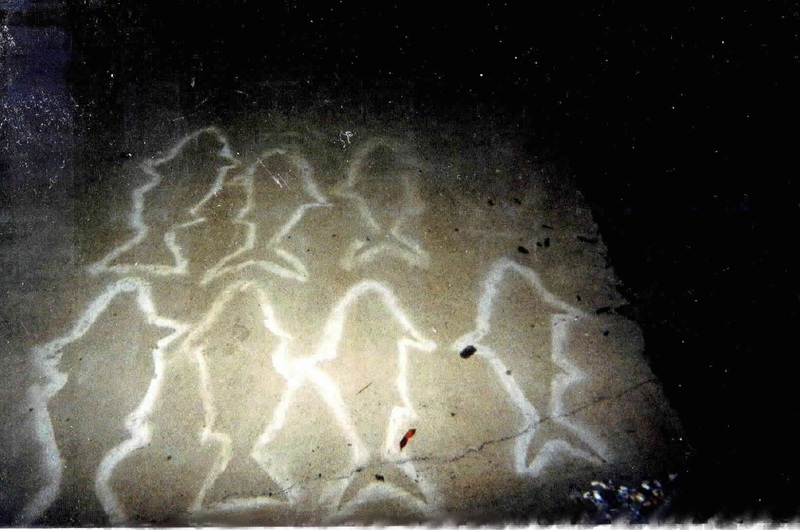 From appearances it looked as if some one were painting some fish-shaped figurines on their driveway, leaving behind these ethereal traces of what they did. The objects that were painted were, I suspect, the kind of kind of bric a brac one observes in suburban enclaves, waiting rooms and dead gardens, which is to say , tacky. This ghost school, forever in place and swimming against grainy, cracked cement tide, justifies the probable kitsch from which this resulted. It made a pleasant summer evening a minor adventure.